Nope ... it's Dorayaki! But filled with savoury filling instead of the usual sweet red bean paste. 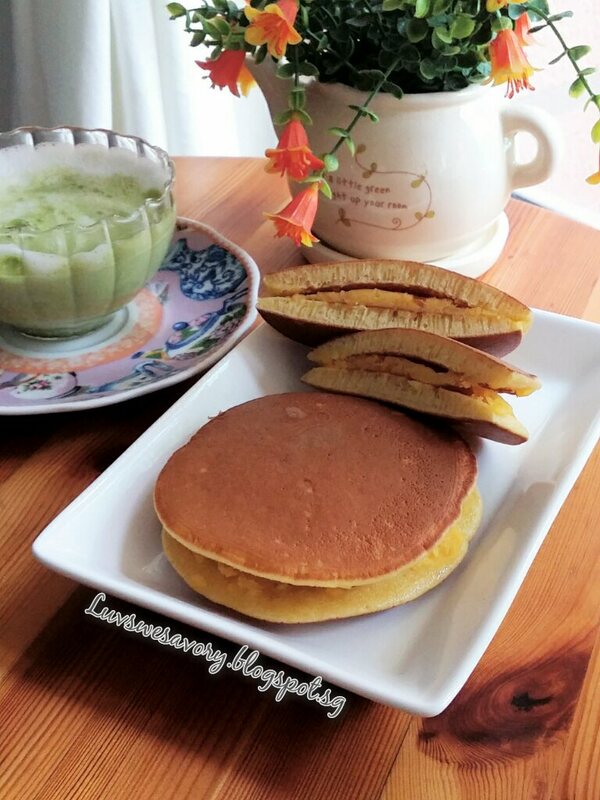 I've made Dorayaki 2 - 3 times since my 1st successful attempt here 2 years ago. Other than the sweet red bean paste filling, I've also tried with kaya filling too. Besides the famous Liu Sha Bao, salted egg yolk prawns/crabs ... I've seen many recent debut of 'salted egg yolk (SEY) craze' that has been raving a storm here in some bakeries/cafes/restaurants ... like SEY Xiao Long Bao, SEY Croissant, SEY Lava Cake, Liu Sha Custard Doughnuts, SEY Cream Puff, Liu Sha French Toast, SEY Crab Spaghetti etc. etc. Previously I had made some Egg Custard Steamed Buns recipe shared by Zoe, so I thought to tweak the custard recipe a little ... Dorayaki with salted egg yolk custard filling ... so call to join the fun SEY maniac ! Ha .. ha! Recipe source : Bake for Happy Kids Egg Custard Steamed Buns, below my slight modified version with added salted egg yolks and adjusted the texture with more coconut milk & butter. Prepare a small cooking pot with water. Boil the salted eggs for about 8 - 10 minutes. Once cooked, shelled, separate the cooked yolks and whites. Use only the yolks, mash with fork till fine. Set aside. Sift custard powder, icing sugar, and cornflour into a saucepan. Whisk in coconut milk. Heat over medium-low heat, stirring constantly, until smooth. Next, add butter and the mashed salted egg yolks. Stir constantly until the thickened mixture comes away from the sides of the pan and forms a firm texture. Transfer the filling to a bowl and allow it to cool down completely. Once cooled and spreadable, ready to use/spread on pancake. If not use, cover the surface of the custard with cling wrap to avoid any condensation form on the cling wrap dripping on the custard. Leave in fridge to chill until ready to use. Makes 10 (20 pancakes) Note: I yield 8, 16 pancakes as I used ice-cream scoop. About 2 teaspoons cooking oil for greasing the pan. Combine and sift the plain flour & baking powder together. Set aside. In a large bowl, combine eggs, sugar, and honey and whisk well until the mixture becomes frothy. Add the flour into the egg mixture. Whisk mixture gently until just combined. Do not over-mix the batter after the addition of dry ingredients. Cover the batter with cling wrap and place it in the fridge to rest for 15 mins. Heat a non-stick frying pan over low flame. Dap some cooking oil with kitchen towel and lightly grease onto the non-stick pan. Wipe off excess oil if necessary. Hint: The oil on the frying pan should not be visible. My observations : I find that without greasing the pan with any cooking oil, it yields evenly nicely brown texture of the pancake. So after the 1st three rounds, I did not grease the non-stick pan. I used an ice-cream scoop to scoop batter onto the warm heated pan to cook. Flip gently with a spatula when surface are covered with bubbles. Cook for another 30 - 40 secs. Transfer to a plate and cover up with cling wrap to prevent the pancakes from drying. Repeat the cooking process till finished the batter. 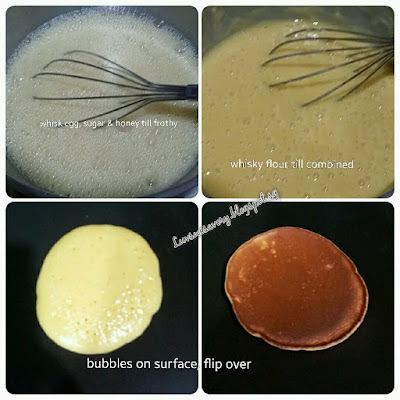 Spread about 1.5 tablespoonful of salted egg yolk custard filling on each of 8 pancakes. Place the other pancakes on the pancakes with the paste to form a pancake sandwich. Wrap each sandwich with cling wrap to make them moist, tasty and 'stayed in shape'. Having tried 2 Dorayaki batter recipes, both work well for me. Enjoy! Yeah! Glad that they liked the savoury fillings. Karen, can I have one? hee..hee... I love salted egg yolks and the other day I ate a croissant with salted egg yolk filling. It was so good! Hi Karen, I love salted egg yolks in anything! Ha ha. 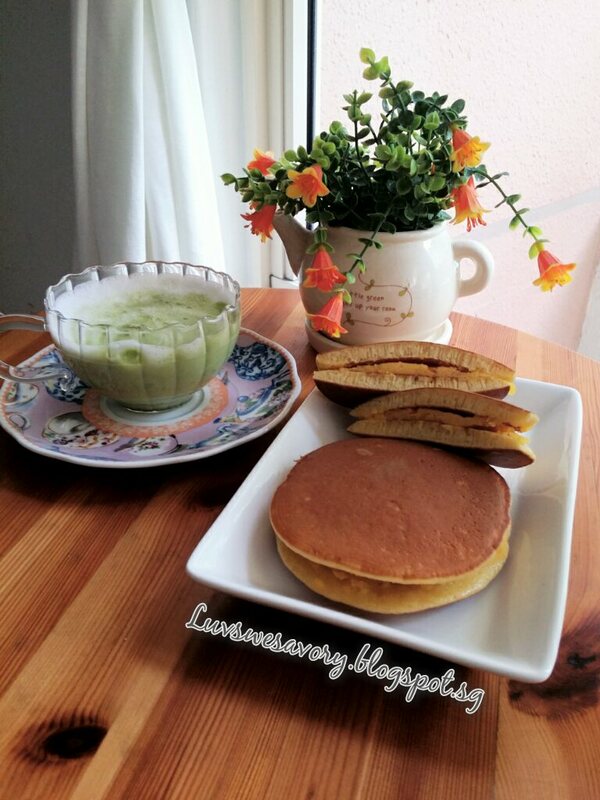 Your Dorayaki pancakes look so yummy! What an interesting recipe, Karen!!! I love the concept of stuffing those pancakes. I'll have to remember that. I used to buy dorayaki from the bakery for my kids when they were younger. It has been some years since they had any! 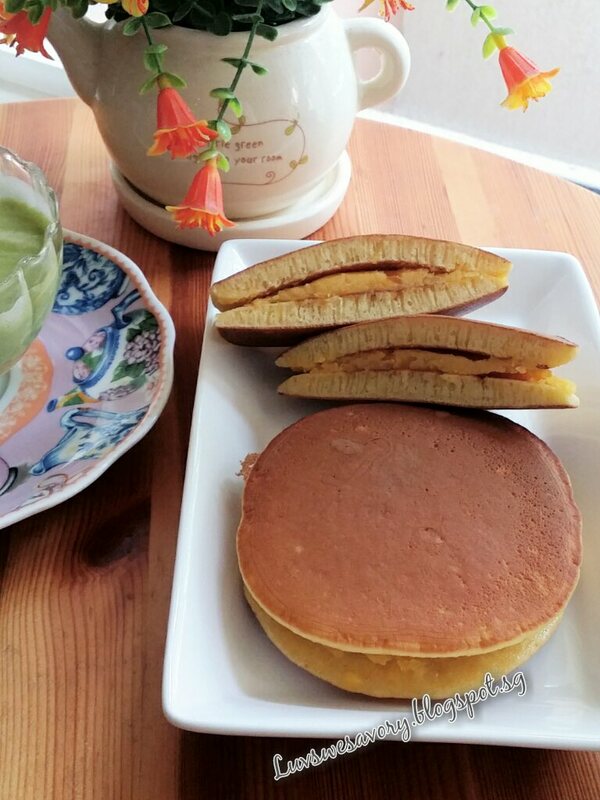 Your dorayaki looks wonderful. Makes such a very nice snack and a delicious tea-time treat! 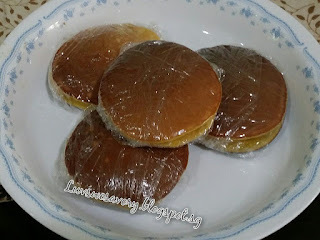 I love this Dorayaki recipe. I have tried a few and would say that this is the best so far :) You are very creative making it with salted egg yolk filling :) Yum! Yum! Hi Karen, Dorayaki pancakes sound amazing, love the salted egg yolk filling, so creative. Take care!